Sign up for Broadjam today to follow Mike Vlahopol & The Crossroads, and be notified when they upload new stuff or update their news! 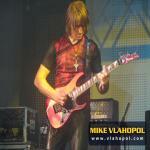 Encouraged by Steve Vai, Jennifer Batten, and many others - autodidact - Mike Vlahopol collaborated with many local bands making a way for himself to start international collaborations. Right after the Romanian revolution he managed to be the stage coordinator for: THE SCORPIONS, Uriah Heep, Deep Purple, MICHAEL JACKSON, WHITESNAKE '97, JULIO IGLESIAS, STEVE VAI - "THE ULTRA ZONE, STEVE VAI -Golden Stagg, Enrique Iglesias, Garden of Eden, Schicht Acht, Tiamat and few others. Jennifer and Steve have encouraged Mike to keep up the good work. Great track, great guitar tone. Like the modulations within the track.